Age-specific incidence rates rise steeply from around age 55-59. The highest rates are in the 85 to 89 age group for males and females. Incidence rates are significantly lower in males than females in the younger age groups and significantly higher in males than females in the older age groups. The gap is widest at age 90+, when the age-specific incidence rate is 1.7 times higher in males than females. Adults aged 50-74 account for more than half (53%) of all new cancer cases, and elderly people aged 75+ account for more than a third (36%), with slightly more cases in males than females in both age groups. There are more people aged 50-74 than aged 75+ in the population overall, hence the number of cancer cases is higher in 50-74s, but incidence rates are higher in 75+s. Data is for UK, 2013-2015, ICD-10 C00-97 Excl. C44. This chart excludes non-melanoma skin cancer because of known under-reporting. 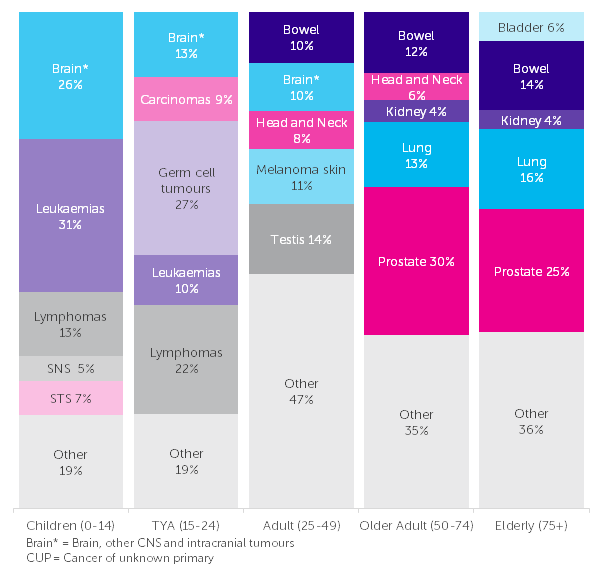 For the 25-49 age group, data in this chart do not sum to the all cancers combined total provided elsewhere, because 'Brain, other CNS (central nervous system) and intracranial' includes tumours that are malignant, benign and of uncertain or unknown behaviour but only the malignant tumours are included in 'all cancers combined' total. Percentages may not sum to 100% due to rounding. SNS: Sympathetic nervous system. Brain tumours: brain, other central nervous system (CNS) and intracranial tumours, including malignant, benign and uncertain or unknown behaviour tumours. Germ cell tumours e.g. testicular germ cell tumours. Carcinomas e.g. thyroid, cervix, bowel and ovary tumours, Children: cases 2006-2008, Great Britain. Teenagers and young adults: cases 2000-2009, UK. 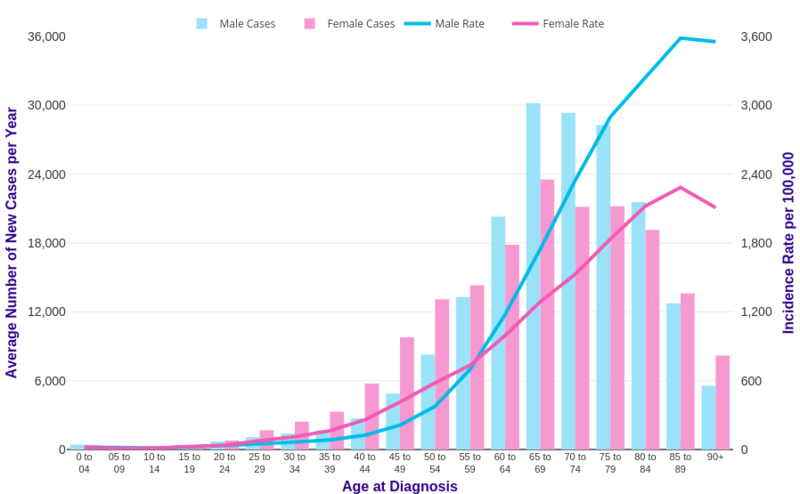 In male young people in the UK, germ cell tumours are the most common cancers, accounting for more than a quarter (27%) of all cases in 2000-2009. Data were provided by ISD Scotland on request, August 2017August 2017. Similar data can be found here: http://www.isdscotland.org/Health-Topics/Cancer/Publications. Stiller CA. Childhood cancer in Britain: Incidence, survival, mortality. Oxford: Oxford University Press; 2007. Data were provided by North West Cancer Intelligence Service (NWCIS) on request. This chart excludes non-melanoma skin cancer because of known under-reporting. 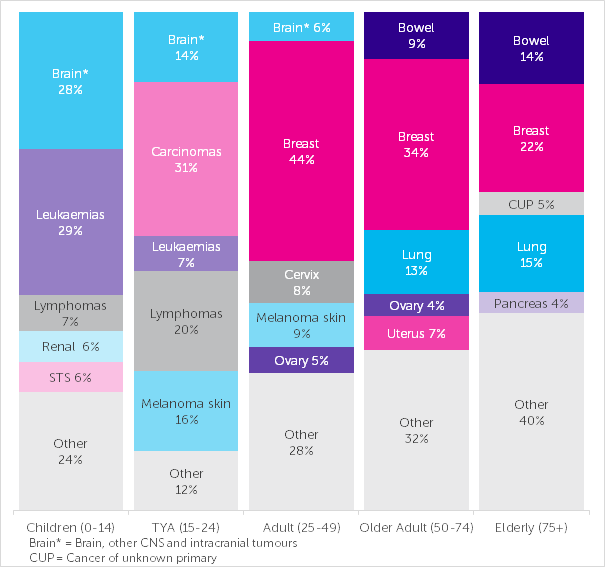 For the 25-49 age group, data in this chart do not sum to the all cancers combined total provided elsewhere, because 'Brain, other CNS (central nervous system) and intracranial' includes tumours that are malignant, benign and of uncertain or unknown behaviour but only the malignant tumours are included in 'all cancers combined' total. Percentages may not sum to 100% due to rounding. SNS: Sympathetic nervous system. Brain tumours: brain, other central nervous system (CNS) and intracranial tumours, including malignant, benign and uncertain or unknown behaviour tumours. Carcinomas e.g. thyroid, cervix, bowel and ovary tumours, Children: cases 2006-2008, Great Britain. Teenagers and young adults: cases 2000-2009, UK. In female young people in the UK, carcinomas are the most common cancers, accounting for almost a third (31%) of all cases in 2000-2009. 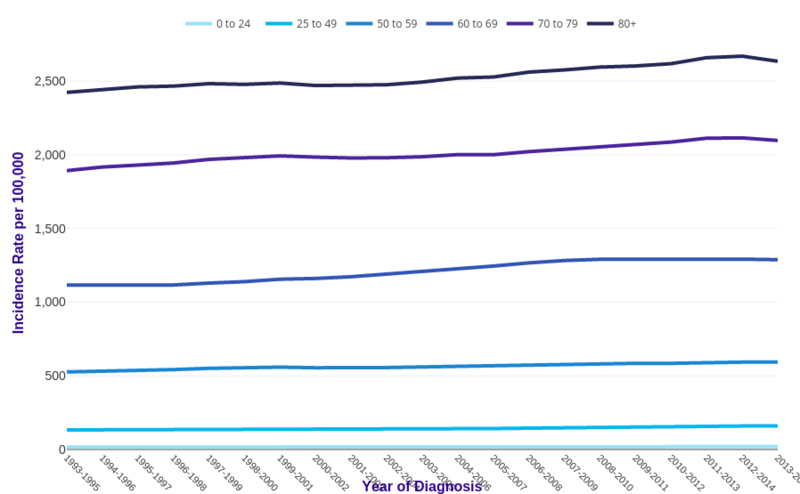 All cancers combined incidence rates have increased overall in all broad age groups in males and females combined in the UK since the early 1990s. [1-4] Rates in 0-24s have increased by 24%, in 25-49s have increased by 20%, in 50-59s have increased by 13%, in 60-69s have increased by 15%, in 70-79s have increased by 11%, and in 80+s have increased by 9%. All cancers for people aged 0-24 includes all malignant tumours (ICD-10 codes: C00-C97) and all benign/uncertain or unknown behaviour brain, other central nervous system and intracranial tumours (ICD-10 codes: D32-D33, D35.2-D35.4, D42-D43 and D44.3-D44.5). All cancers for all other age groups do not include non-melanoma skin cancer (ICD-10 codes: C44) or benign/uncertain or unknown behaviour brain, other central nervous system and intracranial tumours. For most cancer types, incidence trends largely reflect changing prevalence of risk factors and improvements in diagnosis and data recording. Recent incidence trends are influenced by risk factor prevalence in years past, and trends by age group reflect risk factor exposure in birth cohorts. All cancers for people aged 0-24 includes all malignant tumours (ICD-10 C00-C97) and all benign/uncertain or unknown behaviour brain, other central nervous system and intracranial tumours (ICD-10 D32-D33, D35.2-D35.4, D42-D43 and D44.3-D44.5). All cancers for all other age groups do not include non-melanoma skin cancer or benign/uncertain or unknown behaviour brain, other central nervous system and intracranial tumours ICD-10 C00-97 Excl C44.